It should not come as a surprise to learn that we have an extensive collection of oil lamps in our Cottage. Westerners in particular have a love affair with them. This part of the country was one of the last to be settled and even during the homestead boom, this area was still relatively sparsely populated. Electricity and gas were found in cities and not out on homesteads and small rural communities until rural electric cooperative started forming in the 1930s. Until then, homes and businesses relied on oil or kerosene lamps. The one pictured belonged to my Grandma O’Donnell and was used until sometime in the 1960s. It now has a proud place in my parlor. 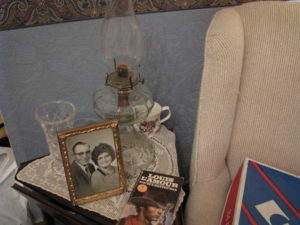 Grandma O’s oil lamp, along with a picture of Grandpa and Grandma O, a tea cup with violets on it (her name was Violet), and a Louis L’Amour book, her favorite author. A Waterford crystal vase is also on the cricket table, a nod to her Irish heritage. All are on top of a hand crocheted doily made by her mother, Myrtle Mae (Mitchell) Bunton. This was in celebration of what would have been Grandma O’s centennial year in 2013.